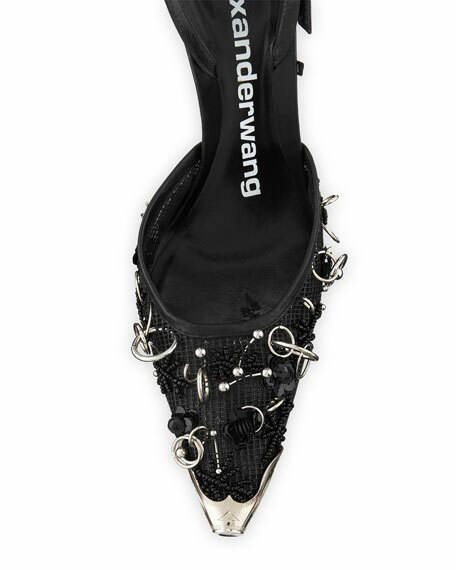 Alexander Wang "Selena" pump in mesh and soft calf leather with hardware-heavy detail. Christian Louboutin napa leather pump. 3.3" covered stiletto heel. Almond toe. Slip-on style. Leather lining. Signature red leather outsole. "Eloise"
Christian Louboutin napa leather pump. 3.3" covered stiletto heel. Almond toe. Slip-on style. Leather lining. Signature red leather outsole. "Eloise" is made in Italy. Rene Caovilla suede pumps with pearly trim. 4.1" covered stiletto heel. Peep toe. T-strap vamp. Leather lining Signature glittered outsole. Rene Caovilla suede pumps with pearly trim. 4.1" covered stiletto heel. Peep toe. T-strap vamp. Leather lining Signature glittered outsole. Made in Italy. Saint Laurent pumps in satin with sequined stars. 4.1" covered stiletto heel. Pointed toe. Slip-on style. Leather lining and sole. Saint Laurent pumps in satin with sequined stars. 4.1" covered stiletto heel. Pointed toe. Slip-on style. Leather lining and sole. "Palace" is made in Italy. Fit note: Saint Laurent shoes run small. Please order a 1/2 size larger than you typically wear. Sesto Meucci waterproof stretch microfiber pump. 1.5" chunky heel. Round toe. Leather backstay. Slip-on style. Padded footbed. Flexible rubber outsole. Sesto Meucci waterproof stretch microfiber pump. 1.5" chunky heel. Round toe. Leather backstay. Slip-on style. Padded footbed. Flexible rubber outsole. "Yair" is made in Romania.